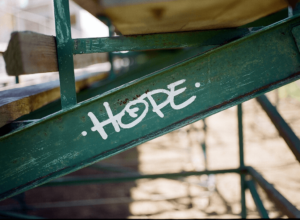 There is always hope for recovery and studies show that the recovery model is critical in improving outcomes in mental health and wellness. The shift from a medical model of treatment to recovery-oriented care is still relatively new and, though there are national-level Recovery to Practice curricula for six behavioral health disciplines, many have yet to implement it. In 2015, the Hogg Foundation awarded grants to support six behavioral health disciplines to bring the Recovery to Practice initiative to Texas, one of which went to the American Psychiatric Nurses Association (APNA) Texas Chapter. For the APNA Texas Chapter, translating the recovery-oriented curriculum into practice includes in-person training, content tailored to the audience, and intentional integration in organizational culture. Using the Recovery to Practice curriculum, the APNA Texas Chapter is changing the way nurses and other providers care for patients with mental health issues. For many years, individuals who identified as having a mental illness were merely “treated” with no hope of a better life. Their basic needs may have been met – food, housing, sometimes medication – but with no goal of improvement or recovery. However, there has been a shift away from a medical model of treatment to recovery-oriented care, which focuses on instilling hope, connecting people to peer support, self-directed symptom management, and other recovery principles. Recovery is a reality. It can, will and does happen. At the national level, the fields of psychology, psychiatry, nursing, social work, peer support and addiction counseling participated in the Substance Abuse and Mental Health Services Administration’s (SAMHSA) original Recovery to Practice (RTP) initiative and developed curricula to fit their respective professions. The goal of the Hogg Foundation RTP initiative is to support the dissemination of the national curricula across these six behavioral health professions in Texas. RTP helps behavioral health and general health care practitioners improve delivery of recovery-oriented services, supports and treatment. In 2015, the Hogg Foundation for Mental Health awarded grants to support the six behavioral health disciplines in bringing the RTP initiative to Texas. With these grants, Texas became the only state to disseminate the national-level RTP curricula. This story features one of the six disciplines – nursing – and what they’ve accomplished with the RTP grant. Ms. Collins points to several factors in this discrepancy. For one, mental illness is “too close to home.” When a nurse sees a patient who has experienced a heart attack or has diabetes, it’s easy to distance oneself. When it comes to mental illness and substance use – depression, anxiety, alcoholism – you know you are vulnerable and put up barriers. In addition, nurses feel a need to fix people. Being able to solve the issue takes away some of the fear of an illness. “But with mental illness, there are no black and white answers. We still don’t have a clear-cut picture; you can’t do an MRI or run tests to get a definitive answer.” It can be scary and intimidating, and adds a layer of complexity to the nursing practice. The recovery model is critical in improving outcomes in mental health and wellness. 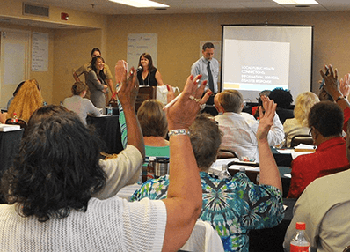 APNA collaborated at the national level with peers and psychiatric-mental health nursing leaders to promote recovery, and to develop curriculum and training materials to increase nursing knowledge of recovery-oriented care and how it translates into practice. There were several key measures for ensuring the success of this program for the psychiatric nursing field. The original intent was to disseminate the content as quickly and conveniently as possible, which lent itself to an online course. However, APNA quickly heard feedback that the course needed to be presented in person. Nurses expressed a need to meet face-to-face to talk through some of the sensitive issues around recovery and how to work with patients. What resulted was a live program that can vary in format or size. When considering the audience for the training, APNA identified nurses working in acute psychiatric inpatient settings since that’s where many people first come in contact with the mental health care system. This is also where students gain a lot of experience and is a good introduction to a recovery-oriented mindset. “We want them to learn from the day they walk into their clinical experience that recovery is not only possible, but also probable,” says Dr. Black. APNA quickly realized that this in-person format led to a richer dialogue among participants. Nurses began to share their personal experiences with mental health challenges and discussed the day-to-day practices and policies that could be changed. They began asking: “Why do we do it this way?” and “Is this person-centered?” Using a recovery approach became foundational in their practice and helped them meet expectations for proficiency in psychiatric-mental health nursing competencies. “The ultimate goal of Recovery to Practice is to move away from the typical medical model,” says Ms. Bryan of the Hogg Foundation. As with Ms. Collins’ epiphany about Lucy, for many hospitals, the adoption of a person-centered approach means a dramatic shift in perspective and culture. Dr. Johnson describes how hospitals are now systemically infusing recovery and trauma-informed care into the culture, including everything from welcome letters for new patients to correcting stigmatizing language throughout the facility. Parkland and UT Southwestern Medical Center-Zale Lipshy teach RTP to all behavioral health employees. Rebecca Deisler, an RTP facilitator, registered nurse and Clinical Manager for Psychiatry at UT Southwestern Medical Center, says they’re broadly disseminating parts of the curriculum throughout the hospital. She attends departmental and leadership meetings to discuss recovery-focused language and is influencing organizational development training for all employees. A culture shift is occurring. Nurses like Ms. Collins are being challenged to adapt their beliefs and, importantly, their practices to provide better care for patients with mental illness. Hospitals are integrating recovery-oriented practices throughout the system, not just with nursing staff. In turn, patients are receiving a better standard of care and better outcomes. Instead of approaching patients like Lucy with a ‘do what we say’ mentality as Ms. Collins described, we are shifting to a ‘what can we do?’ mentality. Nurses with a recovery mindset are asking: What can we do to help you achieve your goals? What’s working and what’s not? How can we help? And every individual in the system is better off for it. In 2010, APNA identified mental health recovery as a gap in nursing practice. That gap is closing. APNA has a vision of recovery as best practice for every psychiatric-mental health nurse in every treatment setting so that people experiencing mental health or substance use disorders can heal and grow. The APNA Texas Chapter has new leadership and their top priority is to promote the RTP initiative and take it to organizations throughout Texas that are interested in learning about recovery. By bringing the RTP curriculum to Texas, the APNA Texas Chapter is changing the way nurses and other providers care for patients with mental health disorders, giving people hope and expectations for a better future. The Hogg Foundation is committed to advancing the concepts and implementation of recovery across Texas and has multiple initiatives aimed at achieving this goal. The goal of the RTP grant program is to support the dissemination of the RTP curricula across the fields of psychiatry, psychology, social work, nursing, peer support and addiction counseling in Texas. At 25 years old, Dr. Frese was diagnosed with paranoid schizophrenia. Since then, he has become a fierce advocate for the recovery movement.